This kid makes me feel really lazy. This is amazing. There used to be a principle known as "statesmanship." Foreign dignitaries, when visiting other regimes, friendly to the US or not, played nice. They acted with class, observed local customs, and regardless of their personal feelings for each other, engendered a climate of good will that often helped build compromise and mutual respect. Those days are gone. If you need proof, just ask Rocky Anderson. When President Bush visited Salt Lake City last year to speak at a VFW convention, Rocky Anderson, while Mayor of Salt Lake City, conducted a protest of President Bush, the war in Iraq, and the veterans attending the convention. Statesmanship would have precluded him from doing so. It is not inappropriate to disagree with government, to protest it's decision, but not when you are a figure entrusted with public service. This, however, is not a post about Rocky Anderson or President Bush. This is a post about statesmanship. This is a post about John McCain. John McCain ran the worst campaign in United States history. He made Dan Quayle look focused and articulate. McCain could not define the message that so many republicans wanted to hear: personal accountability. But this is not a post about marketing, this is a post about Statesmanship. 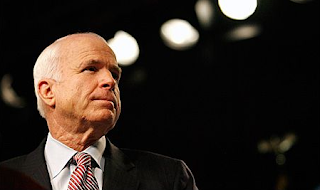 John McCain lost the election in a tidal wave of public backlash. As the French know, nothing unites a country like a common enemy, especially when that enemy happens to have been controversially elected for a second term. But McCain, raised in the generation of Statesmanship, remembered how he had been raised far too late in the game. After calling his opponent a socialist, a terrorist, a commie and a fraud, McCain realized something. His name calling had cost him the election. In focusing so much on his candidates message of change, and seeking to do change better, McCain lost himself the fight. In the cold dark of that election evening, that loss engendered a climate of goodwill once again. I imagine that McCain's mind was touched in his defeat, that he remembered what his mother taught him about others: "If you can't say anything nice..."
And so McCain reinstated Statesmanship that cold November night. He called on his supporters to release their death grip on the rhetoric and get behind their President elect. He continually silenced a booing crowd, and encouraged us to dig in together as citizens of a great nation, not as proponents of opposing ideology. He nobly commanded attention with his predictions that the problems facing us could not be solved with the thinking that created them. Partisan politics got us in to this mess, and only by crossing the aisle can we ever hope to move forward. It was one of the most humbling moments, to see the now penitent man, who had slung so much mud, to encourage the mud slinging to stop. He was the epitome of a Statesman that night, his class ever apparent in his tired face. We need more men like John McCain. I'm not talking about crazy, left wing, pseudo moderate, pseudo neocon, public spending, tax cutting, supply side economics McCain. I'm referring to McCain at his best, when discussing foreign policy, and when giving concession speeches. We need men and women in government who are willing to be penitent, who are willing to show a little grace, a little humility, a little forbearance. We are facing the greatest economic crisis of the century. 1. We have confused wants and needs, making yesterday's luxuries today's necessities. 2. We are running on borrowed time, borrowed energy, and borrowed money. If we don't cut back, we will run out of all three. 3. We believe that it is our government's job to provide for our every need. In the sixties we called this socialism. Today we call it "central planning." Wait, doesn't that term sounds vaguely familiar? In the forties, when we went to war, the entire country cut back. We bought war bonds and conserved resources. We shared a national consciousness and a common enemy. Since Vietnam we have done nothing but fight with each other, bankrupting our government and leaving too many deserving causes out in the cold. Democrats demand more entitlement spending, because that's what gets them re-elected. Republicans demand more tax cuts and subsidies, because that's what gets them re-elected. As a country we are spending more, and contributing less than ever before. Corporations reduce taxable income to mere pennies of the earnings they report to shareholders. Individuals of every class take advantage of tax shelters, all the while asking for more. It's time we put down our weapons and extended our hands to each other. It's time for common sense in government, where we remember that our national balance sheet has the same principles as our personal balance sheets. Each one must be run with just enough debt to expand, but not so much that we're leveraged in a tight rope walk of borrow and spend. We need to cut social spending, raise taxes, and cut back our trade deficit and fraud. We need to shoulder the responsibility for our own actions and realize that if we want America to stay the greatest country on earth, we have be the most responsible generation in years.